I always admire the accomplishments of athletes. In The Apex these rock climbers scale one of the pillars in Garden of the Gods Park in Colorado Springs, Colorado. This park is a registered National Natural Landmark that I strongly encourage you to visit. 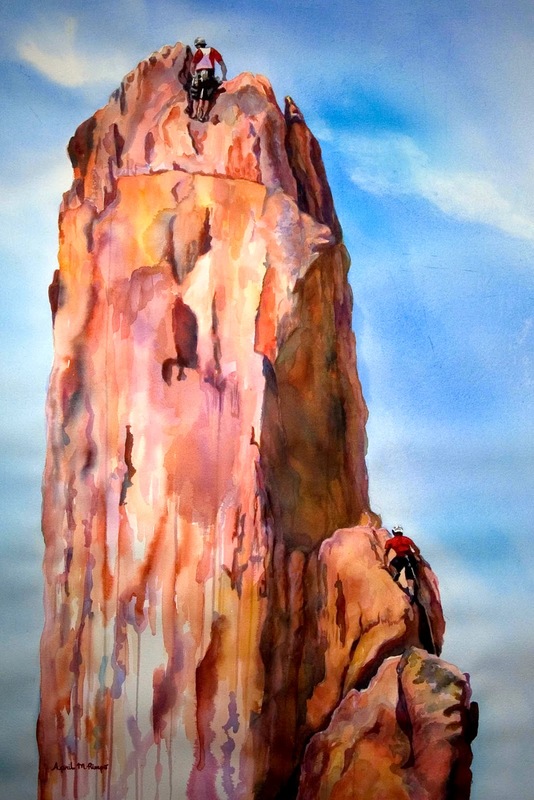 In this painting I am showing only the top third of the peak, so the climbers' accomplishment was very inspirational to me. My goal was to emphasize the majesty of the peak, helping to make the accomplishment of the rock climbers stand out. I felt starting with an under-painting of drips on the peak would add vertical lines, much like the crevices in the stone. These drips serve both to emphasize the attributes of watermedia, but also to help create an illusion of height. I've intentionally left some of these visible in the lower part of the painting. The colors in the Southwest are consistent with my favorite color schemes, so this painting is pretty true to what you would see if you visit this wonderful landmark. In the past I've done a couple paintings where I poured the watercolor paint to minimize the amount of time a brush actually touches the paper. 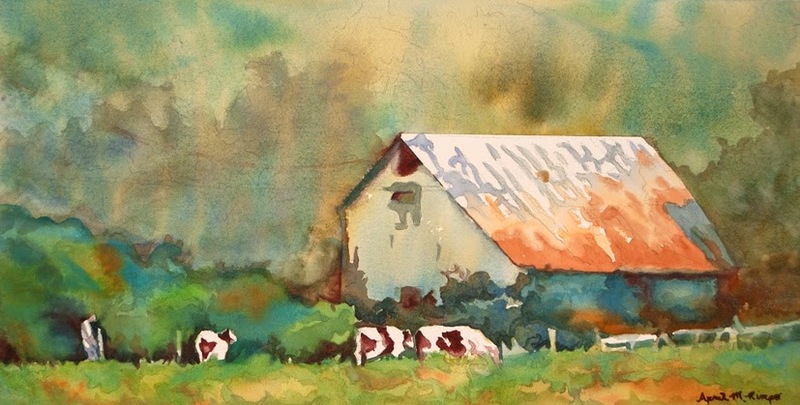 This approach to watercolor is unpredictable and definitely for those who are willing to let the painting tell them what to do next, but can result in the most amazing glowing paintings. I love to watch the paint flow and respond as needed, so this technique is great for me. This week I took a workshop from Linda Baker, who uses pouring in all her work. I decided it was time to take a class from an expert since my previous forays into this technique had been based on reading books and trying it on my own. I've included images in this post of one older poured painting and the one I created this week. Although both exhibit beautiful blends of color, the new painting Harder Times glows more than Back to the Barn. Partially this is due to the pigment choices. Linda Baker is an amazing teacher and filled my head with so much great information I'm sure my work will take another step up as a result of this workshop. Since this approach is so compatible with my painting style I'm sure I'll use it in much of my work. I even plan to give it a whirl when I use fluid acrylics. I'll let you know how that turns out. I attended an Art Business Institute workshop last month, where I learned several things that should help me promote my art, but more importantly I met a number of artists doing fascinating work. One principle promoted in the workshop was the importance of networking. Well I must say network was easy to do at this workshop due to the number of interesting artists working in jewelry, sculpture, ceramics and painting. 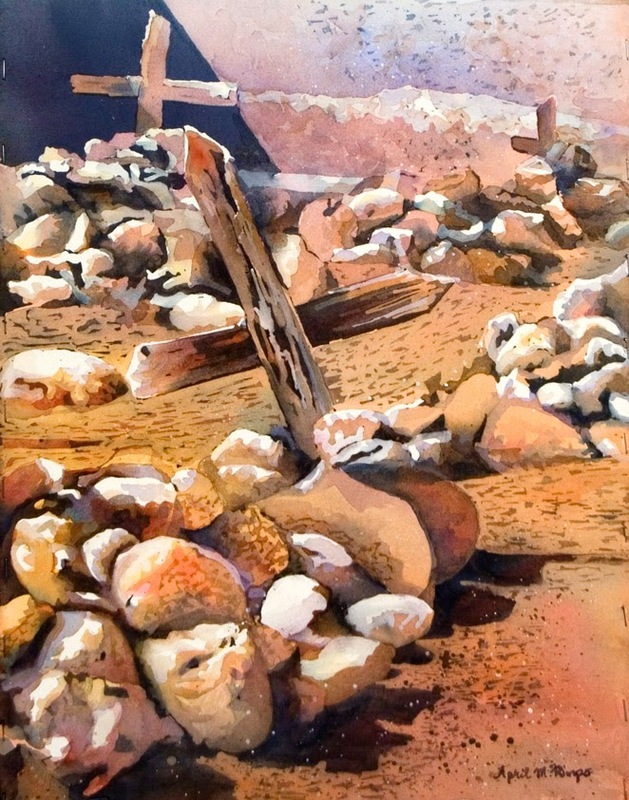 One of the artists was Halide Salam Ph.D, Professor of Art at Radford University. Halide creates very large format abstract paintings with wonderful patterns and textures. Many have been done on shaped stretchers that add a fantastic depth to Halide's work. It is always great to see what other artists are doing. Although my work is very different from Halide's I think we are of kindred spirit in our use of color and texture to add depth to our art. I am also fascinated by the shaped canvases, which is a concept I have not seen before. Here is what Halide says of her work. "These paintings express variations of the energy of the Sacra-movement Order that is prevalent in the natural order of created things by building on traditional sacred geometry and infusing new ideas of space, time and energy."